NOTE for the article below: The astronaut is Scott Kelly; the scientist for the NASA and NSBRI Twin Study is Graham Scott. (USA Today) – NASA astronaut Scott Kelly returned to the U.S. on Thursday after spending nearly a year in space. Now that Kelly is home, his journey is just beginning. 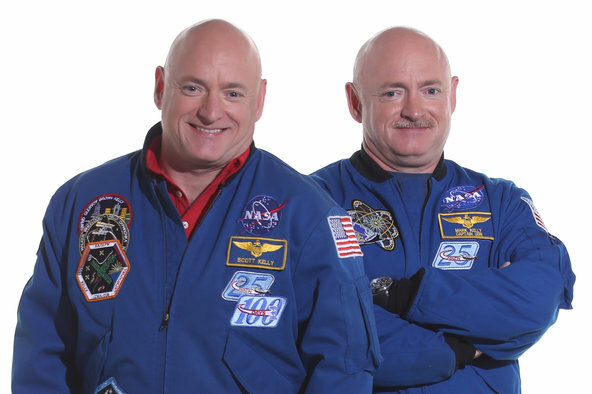 Scott Kelly’s year in space was part of a NASA twin study involving his brother, Mark Kelly. While Scott was in space, Mark remained earthbound, which will allow scientists to study the effects of space travel on the human body in preparation for a crewed mission to Mars. Specifically, researchers are looking at the effects of space radiation, as well as the effect of visual impairment associated with long-duration space flight, according to Graham Scott, chief scientist at the National Space Biomedical Research Institute and deputy project scientist for the NASA and NSBRI Twin Study. 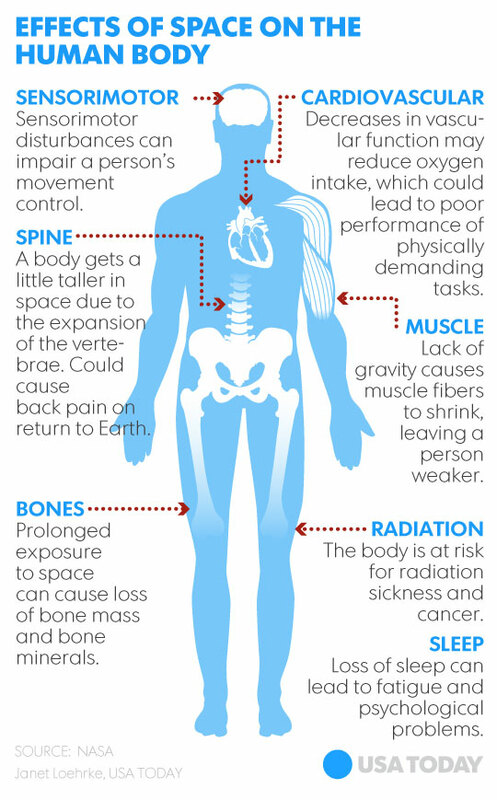 So, what can a year in space do to the human body? One of the primary things researchers will be focusing on is the effect that being in space for almost a year had on Kelly’s vision, according to scientist Graham Scott. “We will be looking at the eyes to see how much visual acuity has been lost,” he said during a phone interview Thursday. For almost a year, Scott Kelly did not have to use his legs to walk, but instead floated to different areas of the space station. In the past, astronauts would leave space with brittle bones and weak muscles because of the lack of use while in space, according to Scott. But today, researchers have helped mitigate the impact on bones and muscles by implementing extensive workout routines that astronauts carry out while in space. Scott said onboard the International Space Station astronauts tie themselves down to a treadmill, strap into a bike and use a resistance device to work out for 2 to 2.5 hours a day. When the bones breakdown, they release calcium, which can also lead to kidney stone formation and bone fractures. Likewise, the lack of use causes muscles to become weak and shrink, which can leave astronauts less coordinated when they return to Earth, according to NASA. Radiation is the biggest issue that astronauts will face as they eventually journey to Mars, Mr. Scott said. On the International Space Station, astronauts get 20 times the amount of radiation people on Earth are exposed to, according to Scott. “If you go on a journey to Mars and get into deep space, there is several hundred times, maybe 300 times the radiation,” he said. He said researchers are extremely interested in the effect radiation has on the heart, blood vessels, bones, central nervous system and the brain. As well as the cancer risk. There is also worry that radiation can accelerate coronary heart disease. He notes that Kelly’s medical study with NASA will continue long after this year, with yearly physical checkups. While in space, the cardiovascular system does not have to work as hard as it does on Earth. “Just like the bones and muscles, the heart is designed to work in one gravity here on Earth, so when you put the heart in space it operates differently and changes shape,” Scott said. He notes that one of the transitionary effects of returning to Earth is that astronauts can feel faint. Scott said that’s one of the reasons that when astronauts return to Earth, they are placed on custom beds to ensure they don’t faint while they are up and walking around. One obvious and temporary change for Kelly was that he came back 2 inches taller than his brother because a lack of gravity causes spinal disks to expand. When astronauts return to Earth, they must re-adjust to gravity and can have issues with balance and simple tasks like standing up, walking or operating a vehicle. Scott said astronauts go through a physical reconditioning program and are typically functioning normally within one-to-three weeks unless they’ve suffered significant bone or muscle loss, which could take months or years to recover from. Reprinted here for educational purposes only. May not be reproduced on other websites without permission from USA Today. Visit the website at usatoday .com. NOTE: The astronaut is Scott Kelly; the scientist for the NASA and NSBRI Twin Study is Graham Scott. 1. How will conducting a twin study help scientists gauge the effects of space travel on the human body? b) Bones and muscle? Be specific. c) How have researchers been able to partially prevent the effects of long-term space travel on bones and muscle? 4. a) Why will radiation be the biggest issue astronauts face when they travel to Mars? 5. Why does the heart shrink in space? 6. Why does a prolonged lack of gravity affect a person’s height? 7. a) What problems do astronauts experience when they first return to earth? b) How long does it take to function normally again? 8. NASA/NSBRI scientist Graham Scott notes that astronaut Scott Kelly’s medical study with NASA will continue long after this year, with yearly physical checkups. Watch the interview with Scott Kelly under “Resources.” Read the diagram in the article. Would you be willing to take the same risks he and other astronauts have? Explain your answer. OPTIONAL: Ask a grandparent why he/she thinks Americans don’t share the same widespread enthusiasm for space travel as they did when our astronauts first landed on the moon. Visit the NASA page on Scott Kelly’s mission: nasa.gov.